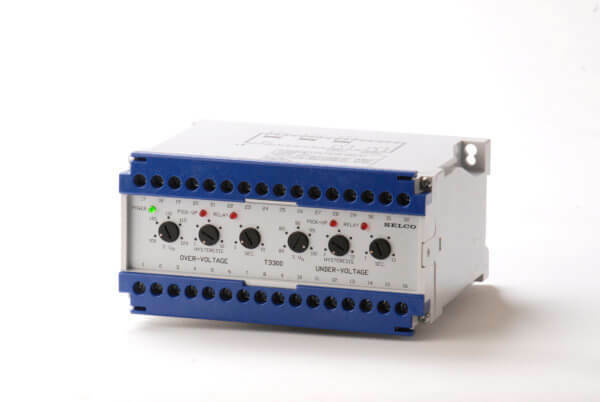 The SELCO T3300 is intended for three phase effective voltage surveillance on generators, busbar or other distribution systems. The relay contains the functions “under voltage” and “over voltage” time delayed, and 2 individual output relays, one relay for each function. The T3300 includes a total of four internal transformers. Three of these transformers are used for measurement and one dedicated to supplying the internal electronics. The internal transformers provide optimal isolation and the best possible accuracy. The use of a dedicated transformer for supply prevents load disturbance to any of the three measurements.